Clients stay comfortable and properly protected with makeup capes featuring high quality construction. Our attractive capes in classic black are the ideal apparel pieces for the luxury spa or retail environment. The lightweight material keeps clients cool as it provides a reliable barrier against powders and liquids. 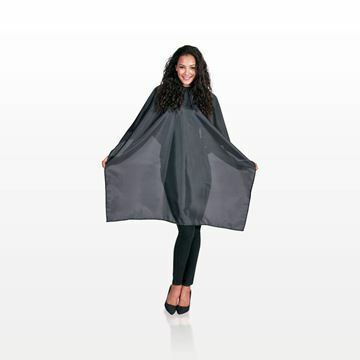 The reusable makeup capes are designed for cosmetic and skin care services that require dependable clothing coverage. 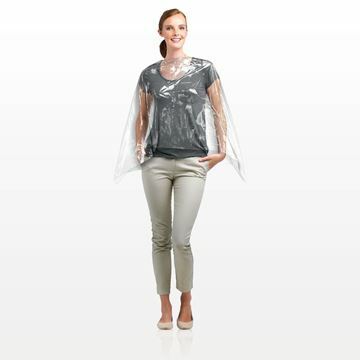 A short cosmetic cape with snap closures can be easily adjusted to accommodate a range of sizing needs. 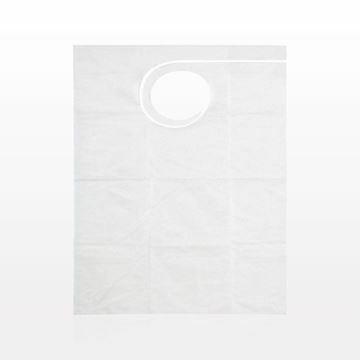 We also carry disposable makeup capes to accommodate busy salons and appointment-heavy retail environments. In addition, our protective apparel line includes wholesale aprons for those providing the makeover. Contact our friendly sales associates to learn about cape customization opportunities. We are here to help with business logo additions or product color requests. 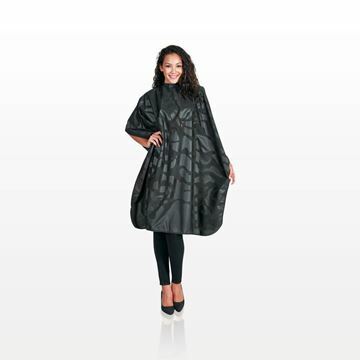 The durable, short cape is a valuable apparel piece for client coverage within the retail, salon or spa business. Our salon apparel selection includes wholesale aprons made specifically for commercial use. Wearers gain front coverage with a greater range of protection from shoulder to thigh. The apron materials share flexibility in movement, as they safeguard clothing or uniforms from product exposure. A wholesale apron from Qosmedix is ideal for beauty service environments. The polyethylene material simplifies quick cleanups in the salon, spa or retail setting. These multipurpose aprons can go beyond beauty applications. They are often paired with shoe covers for industrial or food service tasks. Our sales team is ready to share additional information on our disposable aprons, linens and apparel that serve multiple industries.